Traditionally, personal assistants are for the wealthy with their lack of time for trivial chores. But with the introduction of Siri on the iPhone 4S everyone could suddenly have a personal butler to boss around. Shortly afterwards, a plethora of Android variations followed, giving users choice as wide as the Moon. The latest one of the bunch is called S Voice. It is a love child of Samsung’s hate towards Apple and desire to pack as many features as possible in the Galaxy S III. It’s only logical then to see which one will serve you best – Apple’s Siri, Samsung’s S Voice or the third-party Speaktoit Assistant for Android. Undoubtedly, the coolness factor with these virtual personal assistants is pretty high, but as we found out, they are not that practical and interacting with them is often as distracting as doing the task on your own (not to mention slower). And with that out of the way, let’s get cracking with the comparison. Get some popcorn and enjoy the eleven-minute-long shootout between Siri, S Voice and Speaktoit Assistant for Android. We assure you, it’s worth it. As you saw the test had its highs and lows, but there were some truly hilarious moments. Now, let’s analyze how the phones handled the tasks we threw at them. 1. How’s the traffic in New York city today? Siri and S Voice are off to a good start. Both promptly responded to the request and showed the traffic via Google Maps. The latter, however, didn’t understand what it was told quite well and also asked to enable the GPS for a detailed output, which is okay, but shouldn’t be mandatory. Speaktoit Assistant simply gave up and didn’t offer any help. 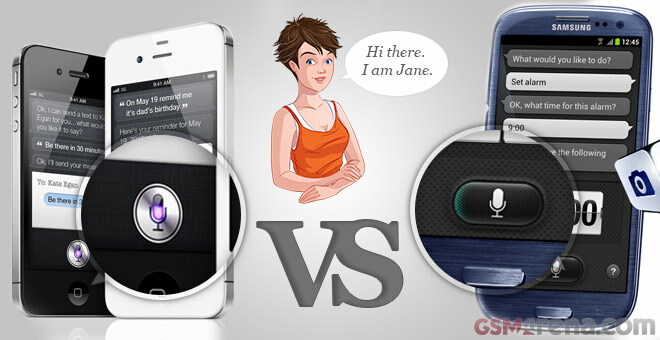 What’s a personal assistant for if it can’t send messages for you? We asked the trio to do just that, but again we got mixed results. Siri did well, but S Voice made us look slow. Since Batman has multiple phone numbers (duh, he’s always reachable! ), the SGSIII asked us to choose one of the three. And so we did. Three times! Little did we know we had to tap our way out of the situation and choose a phone number manually, instead of using our voice. To make matters worse, S Voice didn’t even remotely write what we asked for. Thank goodness, the Joker hadn’t really taken us hostage, because Batman would’ve received “The joker are taking a fat?”, chuckled, and moved on with his business. Finally, Speaktoit Assistant wasn’t up to par with its rivals yet again, not being able to send a simple text message. Only Siri read the message like we asked, which makes it a perfect help tool for the task. 3. Make an appointment with Batman for tomorrow at 6pm. Appointment making is an equally important skill for any personal assistant. Thankfully, all contestants fared well here. Now this is a tricky one. Not only is Facebook a third-party app in both iOS and Android, but it also requires a bit more effort to work flawlessly. The two Android assistants managed to comply with the task, save for Siri. Maybe it’s waiting for Apple to acquire Facebook? 5.What’s the population of New York city? What’s 2 + 2? Sometimes the most simple questions are the hardest to answer. While all managed to pull out relevant information, only S Voice actually spoke the answer right away. The other two saved themselves the effort and only showed the statistics on the screen. 6. When will the world end? Obviously, it was about time we tried something more out of the ordinary. Orders are orders, but it’s nice to have a conversation with your personal butler once in a while. The results are quite mixed on this one. Siri decided to go all scientific on us, while Speaktoit Assistant decided to remain optimistic. In contrast, S Voice showed that it lacks any sense of humor or knowledge on the matter and it simply crashed. Embarrassing indeed. Since Flipboard is available for both iOS and Android (officially for the Galaxy S III only, unofficially for everyone), we decided to let our assistants open it for us. So let’s cut right to the chase – the results were disastrous. Siri isn’t able to open any apps at all, so it just excused itself. S Voice and Speaktoit Assistant, on the other hand, were taught to do so, but they didn’t understand us well enough to complete the task. This is where it really shows how well those apps actually “hear” what you tell them. It turns out they are all half-deaf. And to finish off, the latest assignment was to play a song by U2 called Sunday Bloody Sunday. Happily, everything went according to plan and the song played on all devices. As you witnessed, living with a virtual personal assistant isn’t the easiest thing in the world. They don’t hear well, most of the time they have little clue what you’d like them to do and sometimes they quit on you for no good reason. So where lies their unmatched appeal that made Apple acquire a whole company just to make Siri a reality and cost Samsung a lot of effort and resources just to catch up? Sure, it’s a novelty and could come in handy for disabled people, but other than that, having a virtual personal assistant these days is rather pointless. The three virtual personal assistants are pretty good as a proof of concept pieces of software. However, they fail quite miserably as everyday helpers in trivial tasks. Siri, S Voice, Speaktoit Assistant and your brethren, you are all sacked. Apple, Samsung and everyone who thinks this is the future, could you focus on developing some other tech that actually works, please?